OXFORD, Miss. – The knowledge that attorneys carry comes with great responsibility. Many attorneys and aspiring attorneys use that knowledge to give back to clients in need through pro bono work. 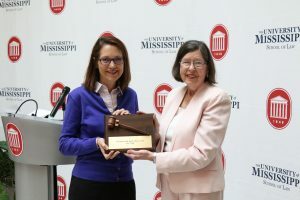 The University of Mississippi School of Law’s Pro Bono Initiative honored the work of students and community attorneys Monday, April 8 with its annual luncheon. Third-year law student Stephanie Gobert, a native of Liberty, Texas, was named Outstanding Student Volunteer of the Year. She first became involved in pro bono work at the start of her second year in law school because she wanted to apply her knowledge of law and theory to practical experience. Gobert was paired with a local attorney and assisted in interviewing and drafting child custody modification documents for a blended family unable to afford private assistance, but who wanted to change their current custody arrangements for the best interest of the child. She found her passion in helping families in need, and wanted to give back through the opportunities she earned. Through PBI, Gobert has volunteered for family law clinics and pro se days as well as North Mississippi Rural Legal Services. In 2018, driven and inspired her previous PBI experiences, she began volunteering at NMRLS under attorney, Al Cutturini, within the Elder Law Project, where she continues to volunteer. Her work with Cutturini involves giving estate planning presentations in Delta church halls on Monday evenings, drafting power of attorney documents protecting elderly residents in nursing homes from exploitation, representing women in divorce proceedings against an abusive husband and helping a family avoid foreclosure and keep their home. “Pro bono work fills every waking moment of any free time I have,” she said. “I am exhausted, but I love what I do, and this is all I ever want to do, and I wish I could do more. And, it all started with PBI, that one pro bono experience, which inspired me for a lifetime. “I know I have truly found my calling,” she said. Though she was born and raised in Texas, Gobert plans to take the Mississippi bar exam after graduation to pursue a career in public interest work and help those in need in the state. Gobert is honored to receive the award, but she would prefer to recognize those who have inspired her along the way. “Our own brilliant Bri Warner, Ms. Kris Simpson and Al Cutturini have done ten-fold the work I have done without thanks, and they deserve this more than I ever would,” she said. Retired attorney Kay Trapp and attorney and UM Law alumna Dinetia Newman were also recognized at the luncheon. They were awarded the 2019 Deborah H. Bell Pro Bono Award for their work on the Lawyers in the Parish Hall clinic. The program began out of the All Saints Episcopal Church Saints Brew Program, which provides meals every weekday to people in need in Tupelo. In 2014, Trapp and Newman decided to form a quarterly legal clinic as part of this program to offer legal advice to attendees. “They not only recruit volunteer attorneys and law students to provide legal advice to attendees, but they also bring experts from the Mississippi Department of Human Services and the Social Security Administration for specific questions they can’t answer and a translator for Spanish-speaking families, as well as representatives from LifeCore to better assist participants in accessing social services,” said Bri Warner, PBI coordinator and third-year law student from Gulfport. UM Law’s Pro Bono Initiative is an in-house program that allows student volunteers to attend legal clinics and team up with attorney volunteers to interview and assist pro se litigants. Students also work on policy initiatives and provide public education on legal issues. At the end of the 2018-19 school year, 61 students provided 915 volunteer hours of legal assistance or education. “Through their pro bono participation, the law students assist low-income residents with resolving issues that present an obstacle in their lives, such as an inability to enroll a child in school or find housing or a job,” PBI director Kris Simpson said. “Both sides recognize the impact. The clients are able to move forward, and the students have gained legal experience and the knowledge that they can truly make a difference. Third-year law students who have completed more than 75 pro bono hours were also recognized at the luncheon. For more information about the PBI, visit law.olemiss.edu.